The terms Digital Marketing, Inbound Marketing and Growth Hacking are not fancy buzzwords! 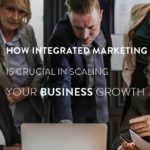 Getting to know how a successful marketing strategy works wonders. This also needs cognizance that is well evident from successful businesses. When you say Digital Marketing, SEO or Social Media Marketing is not the one-pill solution for all your business illness! Identifying the right audience and building an online presence for your business is necessary. This is either performed by reaching out to the crowd or getting them to reach out to you. So creating a space for your business in the right online space at the right time targeting the right set of the populace is your path to the triumph. Traditional Digital Marketing is push marketing or it’s also called outbound marketing. This strategy tries to generate leads by compelling information to the audience like TV Ads. Modes involve SMS, E-mail blasts, digital brochures, micro-sites, electronic billboards, RSS and more that target the customer with a customized message. This form of marketing lets you find your customers instead they find you. This is a better way to raise awareness. If you have much money, it will help in an immediate building of your brand to a wide range of less targeted customers. 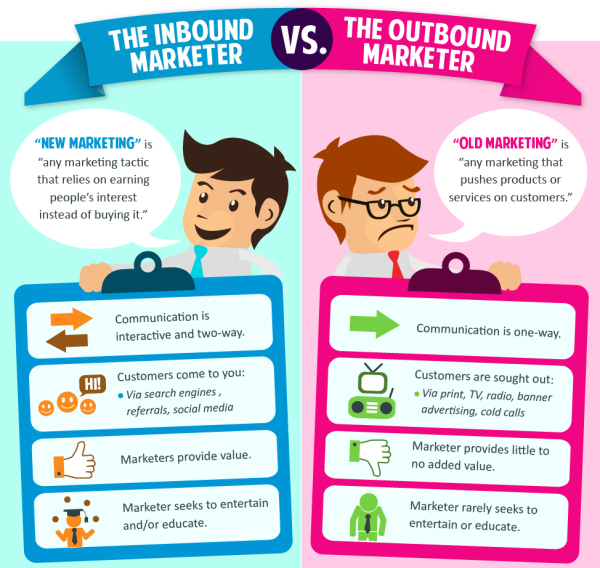 Inbound Marketing is a form of pull-marketing! It aims to encourage and entertain customers. In other words, Inbound Marketing is a series of activities that let to bring customers in rather than you reaching out to them through cold emails or un-targeted ads. This comes to you with effective content marketing strategies. For example, using website, blogs, social media, and more. 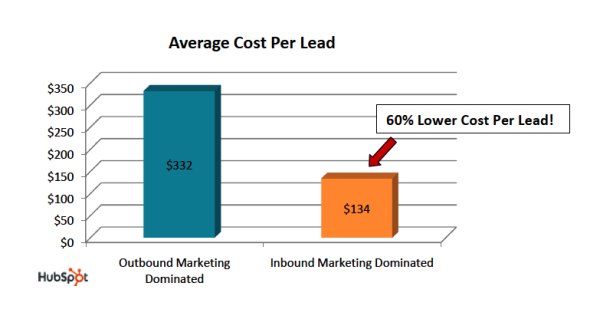 To increase your sale and the quality of lead on market, Inbound marketing would be the result driven one. Inbound marketing builds up by itself and produces many immediate and long-term benefits. All the way from the company launch, Inbound marketing continues to resource new clients and maintain the existing ones. Specific visitors are targeted by providing respective valuable content. This further builds trust. Thus in short sales time, you achieve more qualified leads. Companies that leverage effective content marketing have more opportunity. According to Hubspot statistics, B2B companies that do content marketing 67% more leads per month than those who do not. Thus content in inbound marketing plays its role way quick. Surveys show a 57% increase in marketer adoption of inbound marketing strategy. This resulted in 54% more leads and marketing Cost Per Lead is 60% lower as compared to outbound marketing methods! Inbound Marketing generates sales qualified leads for less money as that compared to traditional marketing or outbound marketing strategies. Inbound marketing attracts strategies via blogs, social media, keywords and pages. The output of this method is that it turns strangers on the media to visitors to the business. The second phase involves converting visitors into leads. This is a call-to-action and is possible via landing pages, forms and contacts. The leads generated need a closure so that the business gets valuable customers. This takes place via email, workflows, lead scoring and CRM integration. The customers then turn into promoters for your business. This takes place via social media, smart ways of calls-to-action, email and workflows. Hubspot’s State of Inbound 2017: Inbound marketing efforts are 62% less expensive. It also states that 71% of B2B and B2C companies are globally reported to be focused on inbound marketing! The phrase “Growth Hacker” was coined by Sean Ellis in the year 2010. Growth hacking is a new online marketing tactic. This approach uses a low-cost strategy to fuel a company’s lead generation. It is a procedure of rapid tests across market channels. Product development and sales segments are identified for effective means of business growth. The main difference between inbound marketing and growth hacking is to be identified. A growth hacker would try anything and everything possible for generating leads. This generates traffic but it demands constant iteration. Growth hacking is a short-term strategy that can be employed as needed, maybe during a startup. It involves temporary work and has a narrowed focus on business growth. For now, the term Growth Hacking is owned by startups. But study reports show that growth hacking will in future be a part of the Fortune 500 companies! Growth hacking depends on your ability to scale up your marketing to generate results. It does not have a universal approach. Growth hacking is thus not considered suitable for varying business types. A growth hacker must own many skills. This includes marketing, analytics and technology, and also creativity. If these ideas go on a toss, they fail. One of the major blunders a B2B startup can make is trying and testing a technique without considering its suitability for the product. A B2B startup can fail miserably if they do not collect required information on consumer demand, customer feedbacks and reviews. If a risk management plan is not a part of the core business strategy, the company can fail at risks. Ignoring costs or making miscalculations impact business growth. It is important to keep a check on CPA(Cost Per Acquisition) with the strategy. Most companies that involve growth hacking techniques often forget the focus on this area. 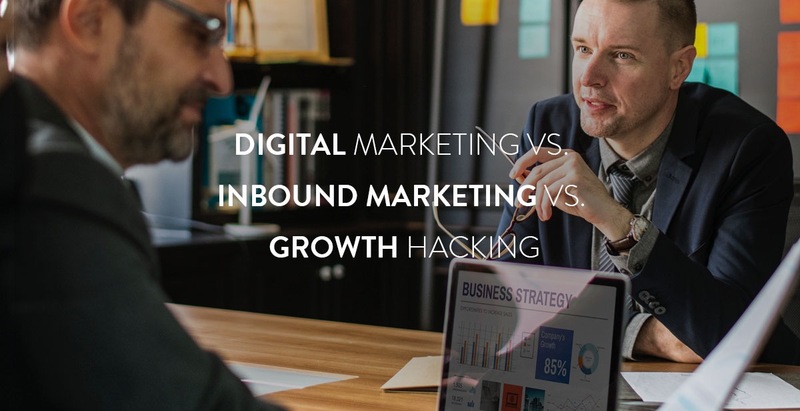 For businesses that seek growth, inbound marketing has more than double the search volume than that of growth hacking. Inbound marketing is designed to promote organic growth. It is done by using educational content, effective social media management, email marketing, fruitful campaign management, surveys, social monitoring etc. Moreover, Lead Nurturing an integrated search strategy is a proved ongoing conversion optimization technique to drive more leads. But growth hacking is not designed for a long-term success. It is best suited for small/ medium-sized companies. A limited marketing budget is selected and repetitive and data-driven tasks are applied. In a nutshell, if you look at the growth spectrum, growth hacking is a sprint in business when you want to take a rapid jumpstart. And inbound marketing is a marathon! 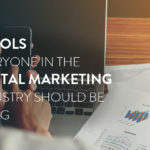 Hubspot, Voltier Digital, Squaredot, Square2marketing, and Inboundmantra.